The just-introduced package pairs up the Big Sur and Napa Valley gems. You adore being by the coast and in wine country, and you have a few days to do both? 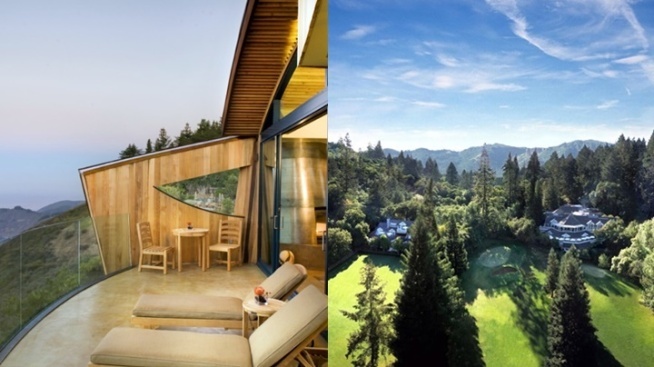 Consider "Experience Two of California's Most Iconic Hotels," a recently introduced package from Post Ranch Inn and Meadowood Napa Valley. POST RANCH INN AND MEADOWOOD NAPA VALLEY: That's right: The Big Sur legend and the wine country landmark have partnered on this posh, all-details-addressed offering, one that includes two nights at each property. At Post Ranch Inn, those two nights will be in the inn's famed Tree House, and two 60-minute massages, a bottle of red wine when you arrive (from Monterey County), breakfast for two people at Sierra Mar, and "(a)ll complimentary resort activities and amenities" are also woven in to the whole package picture. At Meadowood Napa Valley, you'll be staying in a Woodland Suite, Treetop or Lawnview Alcove for two nights, with a daily breakfast for two at The Grill to look forward to each morning, as well as a cooking class (you bet, a Meadowood chef'll be at the lead), a bottle of sparkling wine (from the NV, yes, and when you arrive, upping the celebratory spirit), and a "curated wine tasting itinerary." FOR MORE INFORMATION, send a note to reservations@postranchinn.com or call the inn at 800-527-2200. It isn't often that two great spots in two distinct locations of California pair up on a package, so this is a rare chance to savor both in one relaxing go. That a road trip between the two destinations can be enjoyed over a few hours, with some sightseeing stops folded in (hello, Bay Area, hello, Monterey County), only ups the intrigue. Are these two on your daydream-daily map? Ring Post Ranch Inn now.